Maulana Ndabezitha Karenga, previously known as Ron Karenga, (born July 14, 1941) is an African-American professor of Africana studies, activist and author, best known as the creator of the pan-African and African-American holiday of Kwanzaa. Karenga was active in the Black Power movement of the 1960s and 1970s, and co-founded with Hakim Jamal the black nationalism and social change organization US. 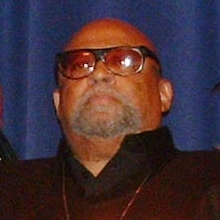 Born in Parsonsburg, Maryland to an African-American family, Karenga studied at Los Angeles City College and the University of California, Los Angeles. During his student years, he involved himself in activism and joined the Congress of Racial Equality. Through his activism, he became involved in violent clashes with the Black Panther Party. In 1971, he was convicted of felonious assault and false imprisonment. He was imprisoned in California Men's Colony until he received parole in 1975. He received his PhD shortly afterward and began a career in academia. Ron Everett was born in Parsonsburg, Maryland, the fourteenth child and seventh son in the family. His father was a tenant farmer and Baptist minister who employed the family to work fields under an effective sharecropping arrangement. Everett moved to Los Angeles in 1959, joining his older brother who was a teacher there, and attended Los Angeles City College (LACC). He became active with civil rights organizations Congress of Racial Equality (CORE) and Student Nonviolent Coordinating Committee (SNCC), took an interest in African studies, and was elected as LACC's first African-American student president. After earning his associate degree, he matriculated at the University of California, Los Angeles (UCLA) and earned BA and MA degrees in political science. He studied Swahili, Arabic and other African-related subjects. Among his influences at UCLA were Jamaican anthropologist and Negritudist Councill Taylor who contested the Eurocentric view of alien cultures as primitive. During this period he took the name Karenga (Swahili for "keeper of tradition") and the title Maulana (Swahili-Arabic for "master teacher"). Malcolm was the major African American thinker that influenced me in terms of nationalism and Pan-Africanism. As you know, towards the end, when Malcolm is expanding his concept of Islam, and of nationalism, he stresses Pan-Africanism in a particular way. And he argues that, and this is where we have the whole idea that cultural revolution and the need for revolution, he argues that we need a cultural revolution, he argues that we must return to Africa culturally and spiritually, even if we can't go physically. And so that's a tremendous impact on US. As racial disturbances spread across the country, Karenga appeared at a series of black power conferences, joining other groups in urging the establishment of a separate political structure for African-Americans. US developed a youth component with para-military aspects called the Simba Wachanga which advocated and practiced community self-defense and service to the masses. In 1966, Karenga founded the newspaper Harambee, which started as a newsletter for US and eventually became the newspaper for the Los Angeles Black Congress, an umbrella organization for several groups. 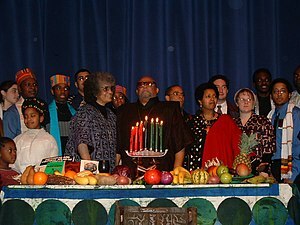 Karenga, center, with wife Tiamoyo at left, celebrating Kwanzaa at the Rochester Institute of Technology on December 12, 2003. Karenga created Kwanzaa in 1966 to be the first pan-African holiday. Karenga said his goal was to "give Blacks an alternative to the existing holiday and give Blacks an opportunity to celebrate themselves and their history, rather than simply imitate the practice of the dominant society." Umoja (unity)—To strive for and maintain unity in the family, community, nation, and race. Kujichagulia (self-determination)—To define ourselves, name ourselves, create for ourselves, and speak for ourselves. Ujima (collective work and responsibility)—To build and maintain our community together and make our brother's and sister's problems our problems and to solve them together. Ujamaa (cooperative economics)—To build and maintain our own stores, shops, and other businesses and to profit from them together. Nia (purpose)—To make our collective vocation the building and development of our community in order to restore our people to their traditional greatness. Kuumba (creativity)—To do always as much as we can, in the way we can, in order to leave our community more beautiful and beneficial than we inherited it. Imani (faith)—To believe with all our heart in our people, our parents, our teachers, our leaders, and the righteousness and victory of our struggle. In 1971, Karenga was sentenced to one to ten years in prison on counts of felonious assault and imprisonment. One of the victims gave testimony of how Karenga and other men tortured her and another woman. The woman described having been stripped and beaten with an electrical cord. Karenga's estranged wife, Brenda Lorraine Karenga, testified that she sat on the other woman's stomach while another man forced water into her mouth through a hose. Deborah Jones, who once was given the Swahili title of an African queen, said she and Gail Davis were whipped with an electrical cord and beaten with a karate baton after being ordered to remove their clothes. She testified that a hot soldering iron was placed in Miss Davis' mouth and placed against Miss Davis' face and that one of her own big toes was tightened in a vise. Karenga, head of US, also put detergent and running hoses in their mouths, she said. They also were hit on the heads with toasters. Jones and Brenda Karenga testified that Karenga believed the women were conspiring to poison him, which Davis has attributed to a combination of ongoing police pressure and his own drug abuse. Karenga denied any involvement in the torture, and argued that the prosecution was political in nature. He was imprisoned at the California Men's Colony, where he studied and wrote on feminism, Pan-Africanism and other subjects. The US Organization fell into disarray during his absence and was disbanded in 1974. After he petitioned several black state officials to support his parole on fair sentencing grounds, it was granted in 1975. Karenga has declined to discuss the convictions with reporters and does not mention them in biographical materials. During a 2007 appearance at Wabash College, he again denied the charges and described himself as a former political prisoner. After his parole Karenga re-established the US Organization under a new structure. He was awarded his first PhD in 1976 from United States International University (now known as Alliant International University) for a 170-page dissertation entitled "Afro-American Nationalism: Social Strategy and Struggle for Community". Later in his career, in 1994, he was awarded a second Ph.D., in social ethics, from the University of Southern California (USC), for an 803-page dissertation entitled "Maat, the moral ideal in ancient Egypt: A study in classical African ethics." Karenga chairs the Africana Studies Department at California State University, Long Beach. He is the director of the Kawaida Institute for Pan African Studies and the author of several books, including his Introduction to Black Studies, a comprehensive Black/African Studies textbook now in its fourth edition. He is also known for having co-hosted, in 1984, a conference that gave rise to the Association for the Study of Classical African Civilizations, and in 1995, he sat on the organizing committee and authored the mission statement of the Million Man March. Karenga delivered a eulogy at the 2001 funeral service of New Black Panther Party leader Khalid Abdul Muhammad, praising him for his organizing activities and commitment to black empowerment. In 2002, scholar Molefi Kete Asante listed Maulana Karenga on his list of 100 Greatest African Americans. ^ De Leon, David (1994). Leaders from the 1960s: A Biographical Sourcebook of American Activism (1st ed.). p. 390. ISBN 978-0313274145. Retrieved May 13, 2012. ^ Mayes, Keith A. (2009). Kwanzaa: Black Power and the Making of the African-American Holiday Tradition. p. 52. ISBN 978-0415998550. Retrieved May 13, 2012. Ronald McKinley Everett was born in 1941. Maulana Kerenga was born sometime in 1963. ^ a b c d Brown, Scot (2003). Fighting for US. ISBN 978-0814798782. ^ Otnes, Cele C.; Lowrey, Tina M., eds. (2011). Contemporary Consumption Rituals. ^ Karenga, Maulana (2002). "UCLA Center for African American Studies, Oral History Program" (Interview). Interviewed by Elston L. Carr. University of California. ^ "Maulana Karenga Malcolm X". "The History Makers". Archived from the original on May 19, 2003. ^ Alexander, Ron (December 30, 1983). "The Evening Hours". The New York Times". Retrieved December 15, 2006. ^ Mayes, Keith A. (2009). Kwanzaa: Black Power and the Making of the African-American Holiday Tradition. Routledge. p. 84. ISBN 978-1135284008. ^ Scholer, J. Lawrence (January 15, 2001). "The Story of Kwanzaa". The Dartmouth Review. ^ "Karenga Tortured Women Followers, Wife Tells Court". Los Angeles Times: 3. May 13, 1971. ^ a b Swanson, Perry (November 22, 2006). "Backers say past of founder doesn't diminish Kwanzaa". The Gazette (Colorado Springs). ^ Halisi, Clyde (1972), "Maulana Ron Karenga: Black Leader in Captivity". Black Scholar, May, pp. 27–31. ^ "Whatever happened to ... Ron Karenga". Ebony. 30 (11): 170. September 1975. ^ Stewart, Brandon (December 1, 2007). "The Story of Ron Karenga, Kwanzaa's Founder". Wabash Conservative Union. Retrieved December 30, 2012. ^ Africana Studies website and Official Website, both accessed November 16, 2018. ^ Asante, Molefi Kete (2002). 100 Greatest African Americans: A Biographical Encyclopedia. Amherst, NY: Prometheus Books. ISBN 1573929638. Biography of Dr. Maulana Karenga.